Are you a homeowner still dealing with damage from Hurricane Irma? Good news: The deadline to register for assistance from Rebuild Florida to repair, rebuild or replace a damaged home was extended to March 29, 2019. Registration is the first step in the process and it can be completed in 15-30 minutes. Rebuild Florida is a program of the Florida Department of Economic Opportunity (DEO), created to help Florida recover from the devastating impacts of Hurricane Irma. The first phase of Rebuild Florida is the Housing Repair and Replacement Program, which will assist families to rebuild their homes that were damaged or destroyed by Hurricane Irma. Rebuild Florida will repair and rebuild damaged homes across the hardest-hit communities of our state, with priority funding for low-income families who are most vulnerable, including the elderly, those with disabilities, and families with children under age 18. If you believe you may be eligible for assistance, please visit RebuildFlorida.gov to register or call Rebuild Florida at 844-833-1010. You can also go to a Rebuild Florida Center to receive help with registration. Florida Legal Services’ Disaster Recovery Hotline is also available to help survivors of Irma, Maria, or Michael at 888-780-0443. Florida's toll-free Disaster Legal Services Hotline Number is 866-550-2929. This is a dedicated hurricane disaster line, funded by FEMA and supported by the American Bar Association, the Florida Board of Governors, and the Florida Young Lawyers Division, where you may leave a message for a lawyer to return your call. For more information about this resource, click here. Visit the Florida Law Help Website for additional disaster relief information and resources. Their website can help people in need find the best legal aid program for their specific issue and location. Visit the national Disaster Legal Aid Website. Florida Legal Services’ own toll-free Disaster Helpline is (888) 780-0443. Rebuild Florida is a long-term recovery effort to help Florida families whose homes were damaged or destroyed by Hurricane Irma repair or rebuild their homes. Learn more at RebuildFlorida.gov. Registration for Rebuild Florida is open until December 23! This program will provide disaster recovery assistance to eligible Florida homeowners impacted by Hurricane Irma, providing much-needed resources that will help rebuild homes in our hardest-hit communities. Learn more at RebuildFlorida.gov. The Rebuild Florida program is open! Register today at RebuildFlorida.gov or by calling Rebuild Florida at 844-833-1010. Rebuild Florida centers will also be opening in the hardest-hit communities. More information, including program FAQs, is now available at RebuildFlorida.gov. FEMA (Federal Emergency Management Agency) offers assistance for sheltering (including paying for a hotel) and money for home repairs, housing, and other assistance (including medical, dental, funeral, essential household items, storage, and vehicle assistance). FEMA assistance does not have to be repaid. Residents and business owners who sustained losses due to Hurricane Michael in the counties of Bay, Calhoun, Franklin, Gadsden, Gulf, Holmes, Jackson, Leon, Liberty, Taylor, Wakulla, and Washington can begin applying for assistance on October 11, 2018 by registering online at http://www.DisasterAssistance.gov or by calling 1-800-621-FEMA (3362) or 1-800-462-7585 (TTY) for the hearing and speech impaired. The toll-free telephone numbers will operate from 7 a.m. to 10 p.m. (local time) seven days a week until further notice. The deadline to apply for FEMA assistance has been extended to Tuesday, December 17, 2018. Assistance can include grants for temporary housing and home repairs, low-cost loans to cover uninsured property losses, and other programs to help individuals and business owners recover from the effects of the disaster. Visit the Florida Law Help Website for assistance if you are denied, are appealing, or need legal advice. Click here for a list of hotels participating in FEMA's transitional sheltering assistance. You must have applied for and be approved by FEMA for this benefit in order to qualify. Are you out of work as a direct result of Hurricane Michael but do not qualify for regular Reemployment Assistance? You may be eligible for Disaster Unemployment Assistance (DUA). To file a DUA claim go to www.FloridaJobs.org or call 1-800-385-3920. The deadline for filing has been extended to Monday, December 31, 2018. The National Employment Law Project (NELP) has prepared a Hurricane Michael fact sheet with basic information about Disaster Unemployment Assistance (DUA). TANF pays money to low-income families with dependent children and pregnant women in their third trimester to help pay for rent, utilities, and other household expenses. TANF is not a disaster program but may help families who have been impacted by Irma. TANF benefits do not have to be repaid. Apply for TANF online. Or you can apply for TANF on a paper application that can be mailed, faxed, or returned to your local Customer Service Center. Download the paper application here. Medicaid pays for medically necessary services for low-income individuals and families. Medicaid is not a disaster program but may help families who have been impacted by a storm or disaster. Medicaid benefits do not have to be repaid. Apply for Medicaid online. Or you can apply for Medicaid on a paper application that you can mail, fax, or return to your local Customer Service Center. Download the paper application here. Enrollment is waived for providers not already enrolled in Medicaid to prescribe non-controlled substances in certain situations. Beginning 11/10/18, Florida Medicaid will return to normal coverage and reimbursement policies except for specified instances in which ongoing impact from the storm affects compliance (e.g., recipient is displaced and must recovery services out-of-state). The Florida Department of Financial Services Disaster Fraud Action Strike Team (DFAST) has been activated in response Hurricane Michael and will be deployed in the affected areas to protect Floridians from storm-related fraud. 1. A contractor or restoration professional who offered to waive or discount an insurance deductible. 2. A contractor or restoration professional that has received payment and has failed to provide any repairs to the home. 3. A contractor or restoration professional who offered to provide repairs at a cash-only discounted rate and has failed to provide repairs to the home. 4. A contractor or restoration professional who pressure the policyholder to sign an AOB and has failed to provide any repairs to the home or stopped responding to contact attempts. Legal aid provides critical resources for all people surviving natural disasters. We help people find safe, secure housing, stand up against discrimination, navigate insurance claims, provide fraud protections, and assist with reproduction of wills or other lost life planning documents. For low-income families, who often have little power or influence, any loss of property or income has a disproportionately heavy impact. Legal aid helps connect people with disaster recovery networks and obtain FEMA benefits and other insurance benefits. We also assist with Landlord/Tenant disputes and foreclosure problems. The Florida Department of Children and Families (DCF) runs the Supplemental Nutrition Assistance Program (SNAP), which used to be known as “Food Stamps,” as well as Disaster SNAP (D-SNAP). D-SNAP gives food assistance to low-income households with food loss or damage caused by disasters, even if they would not normally qualify for SNAP, as well as by replacing and supplementing the SNAP benefits of persons who were receiving benefits when the disaster occurred. D-SNAP has been activated in Bay, Calhoun, Franklin, Gadsden, Gulf, Holmes, Jackson, Leon, Liberty, Taylor, Wakulla, and Washington counties. Impacted persons who lived or worked in any of those counties are eligible to apply. If you want to apply for food assistance from the Disaster Supplemental Nutrition Assistance Program (D-SNAP), check DCF’s website about how and when to pre-register to apply for D-SNAP in your county and what dates you can be interviewed for your D-SNAP application. Interviews can be in-person or by phone. You must pre-register to be interviewed by phone or in person. When you pre-register, write down the registration number that DCF assigns to your case so that you can give it to DCF during your D-SNAP application interview. You are required to have an application interview with DCF to get D-SNAP, but you can decide whether to have that interview by phone or in-person. Damage to or destruction of the household's home or self-employment business. Disaster-related expenses not expected to be reimbursed during the disaster period (such as food loss, home or business repairs, temporary shelter expenses, evacuation expenses, home/business protection, disaster-related personal injury including funeral expenses). Lost or inaccessible income, including reduction or termination of income, or a delay in receipt of income during the benefit period. There are no citizenship requirements or requirements that D-SNAP applicants have a social security number to qualify for D-SNAP. DCF auto-replaced 40% of the October allotment of SNAP benefits for recipients in Bay, Calhoun, Franklin, Gadsden, Gulf, Holmes, Jackson, Jefferson, Leon, Liberty, Wakulla, and Washington counties. SNAP recipients in those counties who lost more than 40% of food that was purchased with food assistance benefits were able to sign and attest to how much was lost up to their monthly SNAP allotment amount. The deadline to apply for additional replacement SNAP benefits was October 30, 2018. In addition, existing SNAP recipients in these affected counties automatically received a supplement to their October 2018 SNAP benefits up to the maximum benefits amount for a family of their size. The most up-to-date and accurate information on SNAP benefits and changes are posted on DCF's ACCESS Florida webpage. Check the ACCESS Florida webpage for current information. To see if DCF is implementing D-SNAP in your area, check DCF’s Food for Florida website. For low-income persons in need of food assistance who did not apply for D-SNAP and are not getting SNAP, apply for regular SNAP online here. You can also apply for regular SNAP on a paper application that can be mailed, faxed or returned to your local Customer Service Center. Click here to download a paper form. Applicants who have been denied SNAP or disagree with the amount of benefits they received have the right to request a fair hearing from DCF to contest the decision. To request a hearing, follow the instructions and timelines in the written eligibility notice provided by DCF. If you did not get a written notice, follow the directions on DCF’s web site at http://www.dcf.state.fl.us/admin/ig/fair-hearing-request-form.shtml. Free legal help from local legal aid programs may be available. To find your local program, go to www.floridalawhelp.org. Are you unable to stay in your home or apartment due to hurricane damage? To date, TSA for survivors of Hurricane Michael is available in Bay, Jackson and Gulf Counties. To apply for FEMA assistance, visit disasterassistance.gov or call FEMA's disaster assistance helpline at 800-621-FEMA or TTY 800-462-7585. No information regarding HUD Vouchers for survivors of Hurricane Michael is available yet. 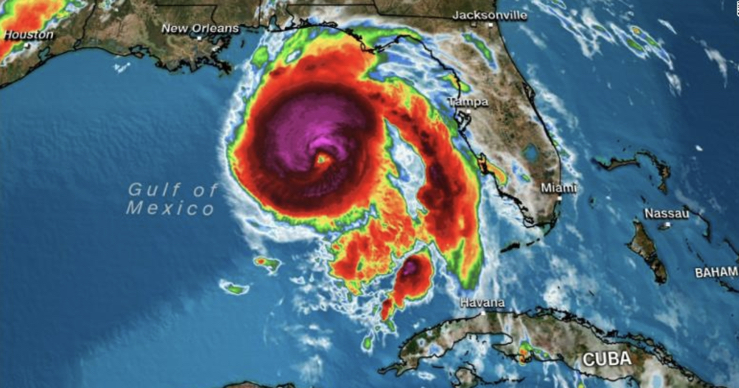 Is your roof damaged by Hurricane Michael? The Blue Roof Program makes temporary repairs to roofs partially damaged by Hurricane Michael. Call 1-888-ROOF-BLU for more information. Florida’s Department of Highway Safety has mobile driver license and motor vehicle services (called FLOW) for Hurricane MIchael survivors to renew, obtain or replace driver's licenses, ID cards, and disabled parking permits as well as to change names or addresses on licenses and ID cards. Go to https://www.flhsmv.gov/locations/florida-licensing-wheels-flow/ for more information. The Department of Health and Human Services (HHS) has activated the Emergency Prescription Assistance Program (EPAP) to allow uninsured Floridians free replacements of certain medical supplies, equipment and medications lost or damaged by Hurricane Michael through 11/15/2018. Uninsured Floridians affected by Michael can visit www.phe.gov/epap or call 855-793-7470 to see if their medication or medical/supplies or equipment are covered and to find a participating pharmacy. Do you need a place to go for help with applying for FEMA assistance? Click here for a list of open DRCs. In addition, FEMA has also published a map of Mobile Registration Intake Centers (MRIC) temporarily deployed across the panhandle to assist Hurricane Michael survivors in applying for FEMA assistance. MRICs are open from 8 a.m. – 7 p.m. local time daily until further notice. The Department of Education maintains a list of school closures by county due to Hurricane MIchael. For students displaced by a disaster or whose schools were damaged beyond immediate repair, Florida Virtual School may be an option. Go to www.flvs.net to begin the registration process. This does not replace Florida’s obligations under the McKinney-Vento Homeless Assistance Act. Thank you to our partner MVP Translations for your dedication to making our critical disaster information available to non-English speaking Floridians! Florida Legal Services advocates for vulnerable populations and their whole legal needs. Our attorneys practice in all of Florida's state and federal courts. We work on the most pressing and current issues faced by low-income and disenfranchised Floridians and embrace a Community Lawyering model of law practice. Formerly known as the Migrant Farmworker Justice Project (MFJP), this project has provided over 20 years of legal assistance to farmworkers and immigrant families working in Florida, including migrant or seasonal farmworkers and temporary agricultural workers under the H-2A visa program. We also provide legal representation to temporary non-agricultural workers under the H-2B visa program and represent clients with work-related legal issues in federal and state courts or administrative proceedings, such as unpaid wages, violations of working and housing conditions, breach of employment contract matters, employment discrimination, and unemployment insurance. We work closely with community services organizations serving the farmworker and immigrant communities throughout Florida. The Florida Institutional Legal Services (FILS) Project is dedicated to protecting and advancing the rights of indigent people in state custody by providing high quality legal services. FILS also works to end mass incarceration in Florida and the reliance on the criminal justice system to resolve social issues. FILS represents juveniles, immigrants, inmates, prisoners and other detainees in a wide variety of state and federal institutions. Our advocates represent the institutionalized and the recently released in individual cases, class actions, and impact litigation. We educate the public about institutional conditions and provide technical assistance to other attorneys and advocates. Maximizing our relatively small resources, FILS litigates proactively to reform existing law. FILS strives to empower our clients, who enjoy the fewest protections and least access to legal resources. The FILS Project also publishes the Florida Manual for Incarcerated Parents. This Manual is designed to help parents who are incarcerated in Florida prisons and jails understand their rights and responsibilities as parents. FILS encourages the widest distribution of this manual. You are welcome to photocopy or reproduce this material, but if you do, please copy the manual in its entirety and please do not charge a fee for the copies. FILS creates reentry information packets, which are intended to assist incarcerated and formerly incarcerated individuals transition into society and their communities by providing a list of resources for each county in Florida. Our state-wide Health Advocacy project works with all Florida Legal Services projects to increase Florida families' access to physical and mental health care and prescription drugs. Our advocates advance our priorities through legislative advocacy, collaboration with other community stakeholders, and impact and class action litigation. Our attorneys work in collaboration with Florida Coalition Against Domestic Violence to provide state-wide legal assistance to victims of domestic violence. Additionally, we provide training to other DV advocates on a range of civil legal issues affecting DV victims. Our attorneys use their substantive expertise to identify and address systems, laws and policies which work against DV victims and their children staying safe and achieving economic security. Our Fair and Affordable Housing project works statewide to preserve affordable housing, support the creation of new affordable housing in areas of opportunity and to promote fair housing for vulnerable populations. Our advocates advance our priorities through legislative advocacy, collaboration with other community stakeholders, and impact and class action litigation. Our Economic Opportunity Project strengthens the economic opportunities of low-income and disenfranchised Floridians. We secure the safety net that protects vulnerable Floridians through effective and innovative systemic strategies to advance public policy and law. We believe that economic opportunity is the cornerstone to preventing poverty. Our children’s advocacy project is dedicated to ensuring that all Florida’s children receive the opportunities, supports, and services they need to lead safe, healthy, and productive lives. Our advocates engage in strategic litigation, as well as legislative and administrative advocacy at both the state and federal levels, to advance the rights of children and youth and improve government systems and programs designed to serve children. Our policy is to provide a fair and equal employment opportunity for associates and job applicants regardless of race, color, religion, national origin, gender, sexual orientation, age, marital status or disability. FLS does not condone or tolerate an atmosphere of intimidation or harassment of any form and requires the cooperation of all associates in maintaining a discrimination and harassment-free atmosphere.